Ever buy something you don’t actually need? I know, I’m on dubious ground here, seeing as I run a whole site devoted to things I don’t technically need. I guess in this context, I’m referring to figures that I more or less already own. In terms of re-releases and the like, I tend to skip them. Today’s review sort of violates that rule, in that there’s not *technically* anything new about either of the figures I’m reviewing here. I’ve reviewed every single piece of both figures before (here, here, here, and here). A little backstory: I got into NECA’s Aliens line on the ground floor, pre-ordering Series 1 a good couple of months before it hit shelves, and then picked up every single release up until Series 6. 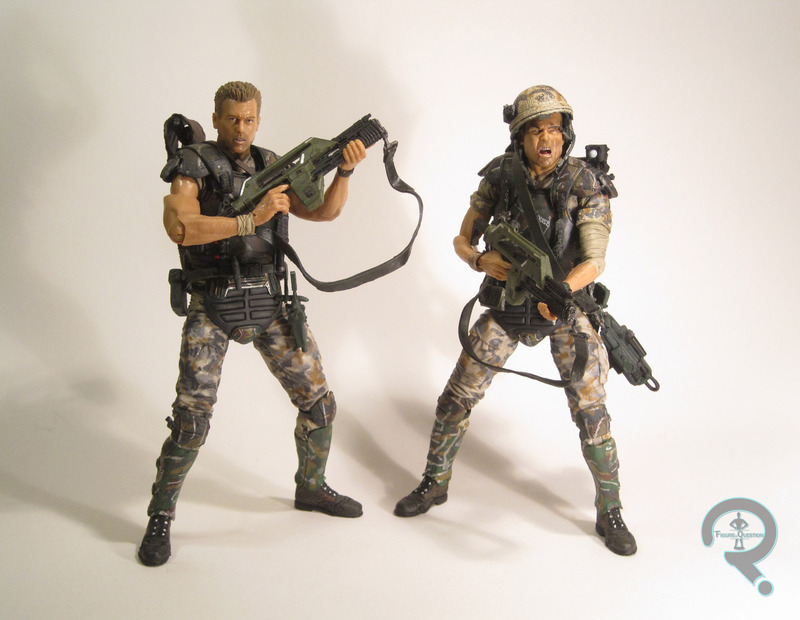 This means I had both versions of marines Hicks and Hudson, who were in the first series and then each packed in a two-pack with a Xeno. However, there are good number of people who didn’t enter the line until around Series 5 or so, when the Aliens version of Ripley was released. This caused a significant jump in the aftermarket prices on both Hicks and Hudson, especially as more of the marines have been released. Not wanting to leave fans missing two major characters from the movie, NECA’s taken advantage of the film’s 30th Anniversary to put out a special two-pack, which offers up both characters again at retail. As I said, technically speaking, there’s nothing new to these guys. So, why am I reviewing them? I’ll get to that. 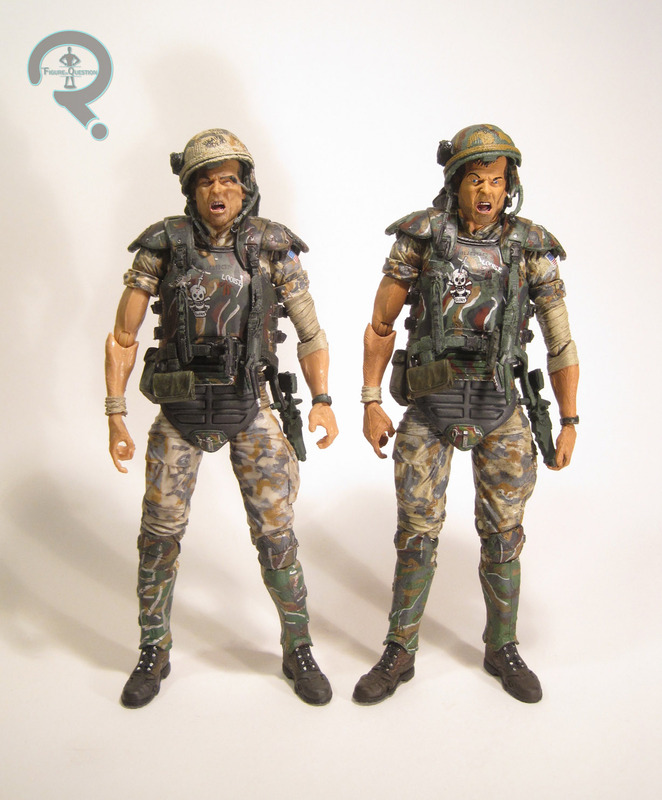 Hicks and Hudson were released as a two-pack within the 30th Anniversary Collection sub-set of NECA’s main Aliens line. They are meant to compliment Series 9’s Vasquez and Frost figures, and they started hitting in March, wedged between Series 10 and 11. Hicks is perhaps one of my favorite movie characters of all time, so by that grace, he gets to go first. If you’ve read my two prior Hicks reviews, you’ll know that this figure stands about 7 inches tall and has 30 points of articulation. You’ll also know that I’m a pretty big fan of the sculpt, particularly the body. None of that has changed, apart from the body having slightly sturdier joint construction this time. This figure has both the un-helmeted and helmeted heads of the single and double-pack versions of the character. Of the two, my favorite is definitely the un-helmeted head. It’s more calm expression works better for the character, and lends itself to a more recognizable Beihn likeness. The helmeted head is okay, but I don’t care for the screaming expression, and I feel the helmet sits a bit too high. The real, important difference on this figure is the paint. While it’s just cleaner in general, the major deviation is how the skin has been handled. 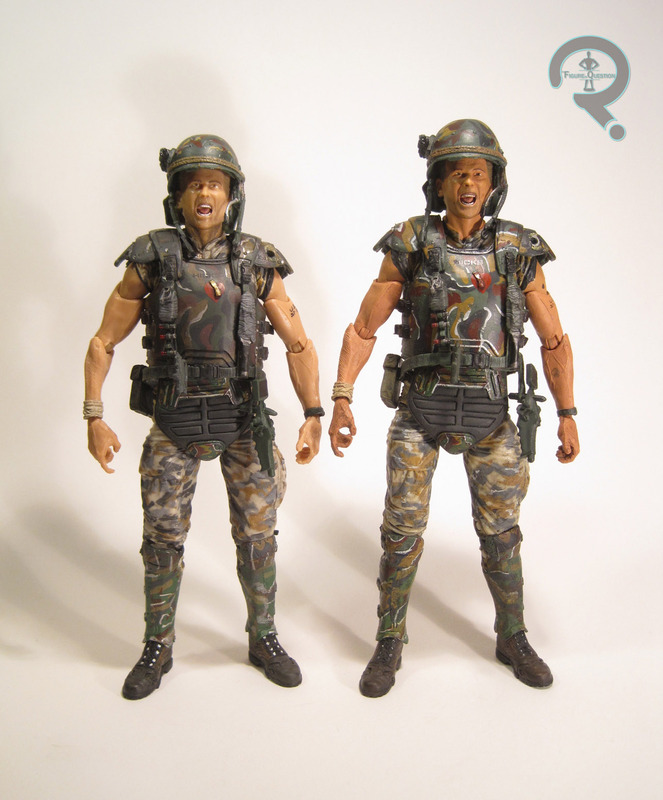 The Series 1 figures hit at a transition point for NECA, as they moved from painted to molded skin tones, and due to the size of the production and costs associated, the Series 1 Marines had painted skin. 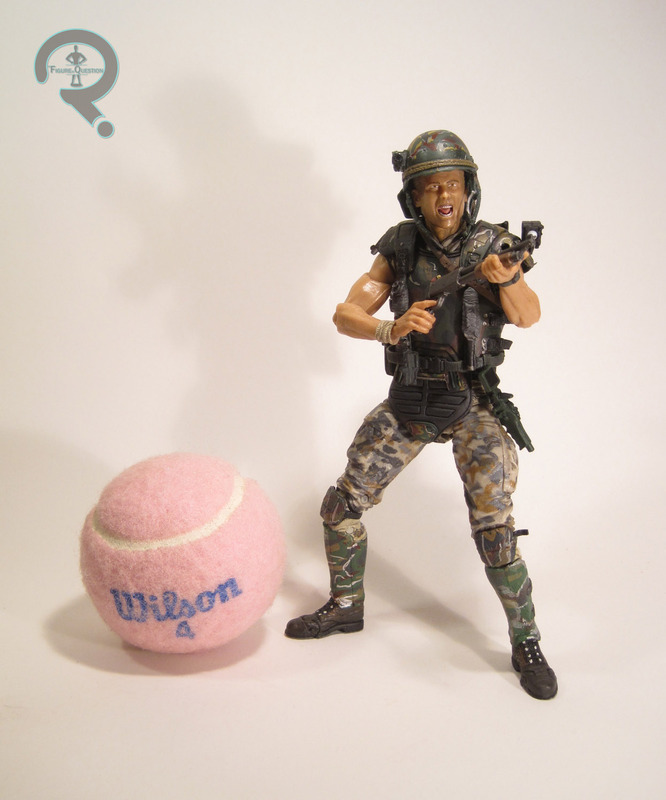 It was far from awful, but later figures, most notably the recent Ripley and Vasquez figures, had the molded skin. 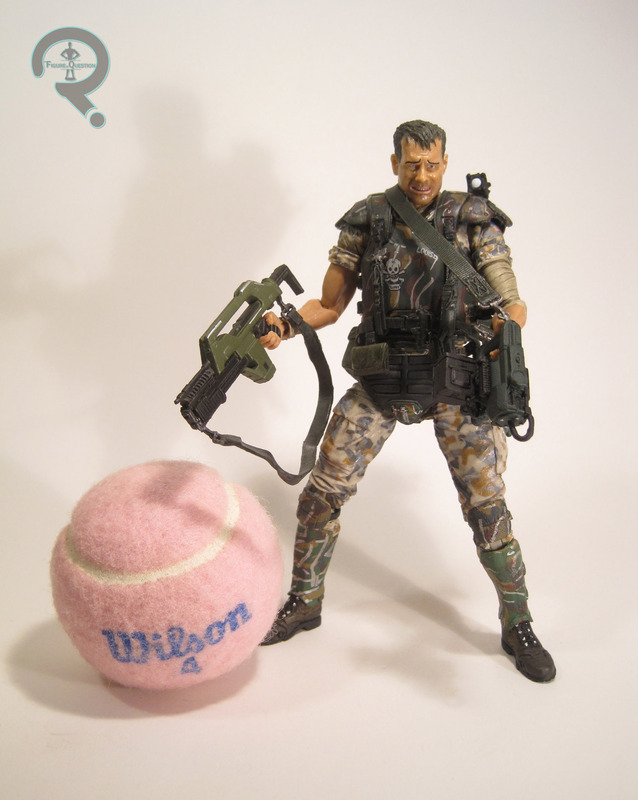 For the re-releases, NECA’s brought Hicks inline with the newer figures. It’s really just a simple change on their part, but it makes for a major change in the quality of the figure. The likeness on both heads is greatly improved by the lack of extra paint, and he looks far more lifelike in general, thanks to how the light hits plastic vs. how it hits paint. In addition to the pair of heads, Hicks has his M41A pulse rifle, his shotgun for “close encounters,” a holster for the shot gun, a motion tracker, and a removable shoulder lamp. Most of these pieces are identical to the original releases, but the shoulder lamp has been tweaked to make it much easier to get it placed on his back (a huge issue with the original figures). Okay, I feel a little bad for Hudson, having just proclaimed Hicks one of my favorite characters of all time. It’s okay Hudson, I still like you too! When I reviewed the original figures, I had some issues with Hicks, but for the most part I was pretty solidly happy with both versions of Hudson. This guy is essentially the same: about 7 inches tall, 30 points of articulation, and a pretty kickass sculpt. Like Hicks, he has both helmeted and un-helmeted heads. Unlike Hicks, I don’t really have a favorite of the two, since I find the likeness on both to be pretty solid, and the issue with the high sitting helmet is avoided. He’s got the same tweaks to the paint as Hicks; everything is sharper overall (though there was a bit of errant paint on his un-helmeted head), and he’s got the new molded skin tone. If I thought the figures were good before, there’s really no topping them here. Hudson gets one more tweak on the helmeted head; the original helmet detailing was rather generic, and was missing Hudson’s character-specific graffiti. This figure adds that back in. It’s one of those things you don’t realize you miss until you see it, and then you really can’t un-see it. Now the older figure just looks wrong (I mean, he always was, but now it’s a more nagging wrong-ness). Hudson has the M41A pulse rifle, motion tracker, and removable shoulder lamp. I didn’t originally plan on getting these, since I had the originals. Seeing them in person at All Time Toys kind of changed my mind, but I didn’t have the money to buy any figures, much less ones that were so similar to ones I already had. But, then my Dad offered to get me an action figure or two in exchange for helping to put down a carpet at my Grandmother’s house (both a resourceful bribe and a reference to the fact that he bought me an action figure the last time I helped put down carpet. I was 4 at the time, but the point still stands). And I also wanted to buy something slightly bigger than the $4 Gambit figure to help support All Time after the Main Street Flood. And I was killing time in Ellicott City. So, these two came home with me. I didn’t really have super high expectations of either figure going in, but I was very surprised to find just how much of an improvement both figures are over the prior releases. They almost feel like different figures. If you missed the initial releases, then you’ll be very happy with these. If you have the originals? Well, it’s hard to say. I might have liked to get a few extras that weren’t seen on the prior figures (headset head for Hicks, non-bandaged arm for Hudson), but I understand why they weren’t included; it’s not doubt to avoid forcing those who have the originals into buying them again, just for a new piece or two. Ultimately, even without any new pieces, I feel this set is different enough to warrant long-time collectors picking it up, but it really comes down to how much of a Hicks/Hudson fan you are. Aaaand I just wrote over 1200 words about figures I already reviewed. Wow. I haven’t been to a Disney park in a decade, but one of my favorite things the last time I was there was the Star Wars-based “Star Tours” and all of the cool Star Wars-themed stuff around it. Over the years, Disney has commissioned a handful of exclusive action figures (some from usual Star Wars toy-producers Hasbro, and some from Disney’s in-house companies) to sell in the ride’s gift shop. My timing always seems to be particularly bad when it comes to these items; both times I’ve been to Disney World, it was in between figure releases. In 2012, they introduced a line of build-your-own figures, under the trappings of a “droid factory,” which is a pretty fun concept. I’ve finally gotten my hands on one, so I’ll be taking a look at him today. 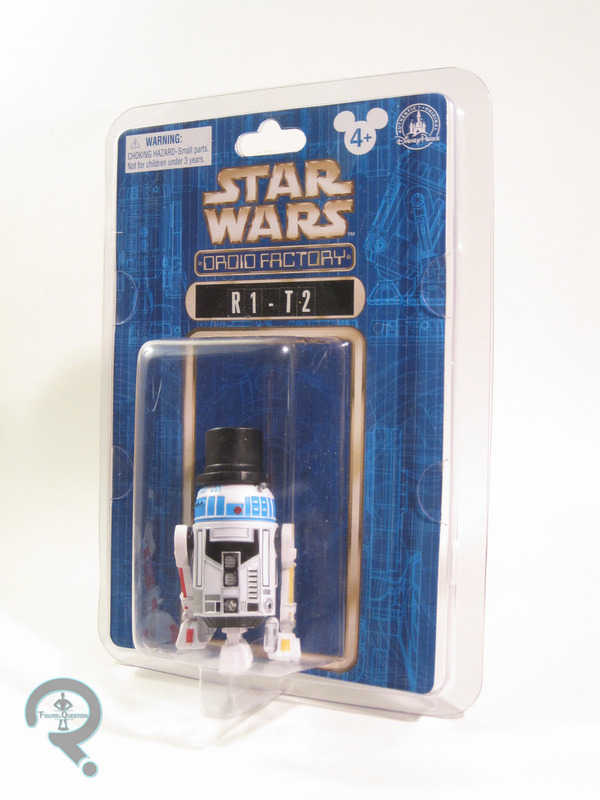 R1-T2 (named by me, of course; if your curious, it’s R1-T2 as in “puttin’ on a…”) was part of the 2015 assortment of Star Wars Droid Factory, which was the second main assortment of pieces. The line is available exclusively through Disney Parks. The figure stands about 3 1/4 inches tall (counting the top hat) and he has 5 points of articulation and actual rolling wheels on the bottom of each foot. R1 is built from six different pieces: a dome, trunk, three legs, and a hat. This droid sticks largely to the R2 style of build, albeit with a slightly modified trunk, which is a little bit more sleek in design. The general quality of the figure’s sculpt is pretty solid; it’s about on par with one of the more articulated astromech’s from Hasbro. The plastic’s perhaps the slightest bit softer than I’d like, but not horribly so, and at least the level of detail hasn’t been negatively affected. One thing I really appreciate is the extra detailing at the top of the trunk, under the dome. It’s not going to be seen under normal circumstances, but it’s still there, and it looks really cool. 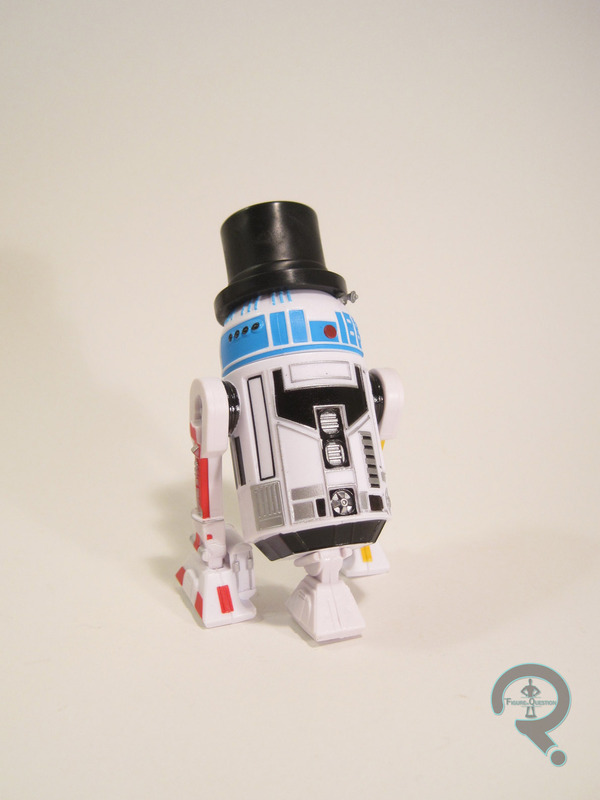 There are ten different possible hats available for the Droid Factory droids; R1 is sporting the top hat, which looks ever so fly. It attaches to the top of the dome via a peg, and it stays nice and tightly in place, but can be removed if you so desire. 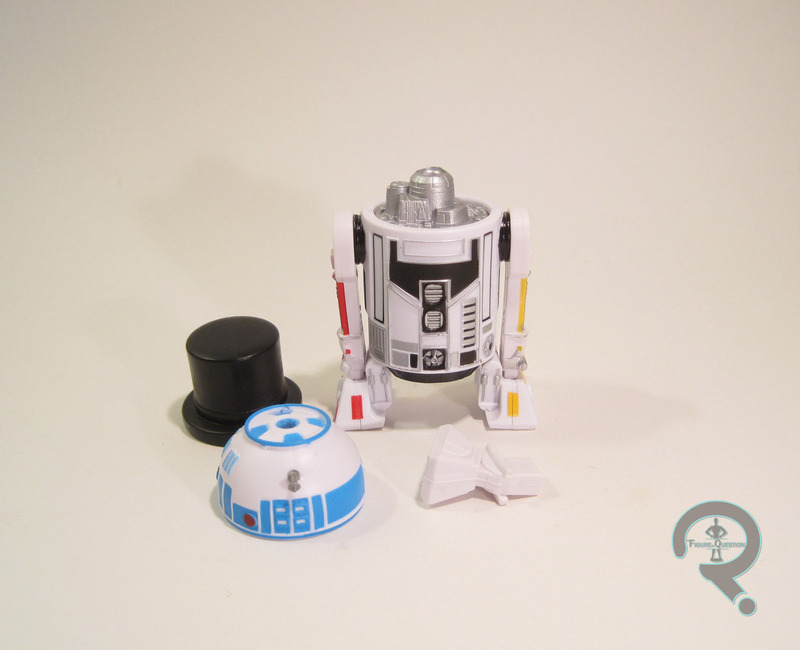 There are a number of different paint schemes available for each Droid Factory piece; R1 sticks with the basics, being largely white with color accents in the three primary colors and a bit of black (which matches up really well with the top hat, creating a tuxedo sort of effect). All of the application is pretty clean; there’s a bit of slop here and there, but nothing outrageous. R1 has no accessories, but he does come with a cool resealable package, which even has a sheet of stickers so that you can put his name on the backer! So, if I haven’t been to a Disney Park since 2007, how did I get an item that was released in 2015? Nepotism. I mean, sort of. See, my brother Christian went to Disney World with his school’s music department, and he made a point of assembling me one of these guys to bring home, and put a lot of care into putting together the pieces he thought I’d like the most. I’m really happy with this little guy, and also really happy to have finally gotten *something* from the Star Tours gift shop. Also, I’d like to give an extra special shout-out to Christian, who is graduating from high school today. Way to go bro! Generally speaking, when it comes to G.I. Joe, I tend to stick with the ‘80s A Real American Hero incarnation of the line (though I’m also partial to the ‘70s Adventure Team incarnation as well). That being said, I was introduced to the brand via my dad and uncle’s old vintage Joes from the ‘60s. Anti-war sentiment following Vietnam led to the end of the original Joe concept, but opinions gradually calmed over the years, allowing for that original concept to make a gradual return in the ‘90s. 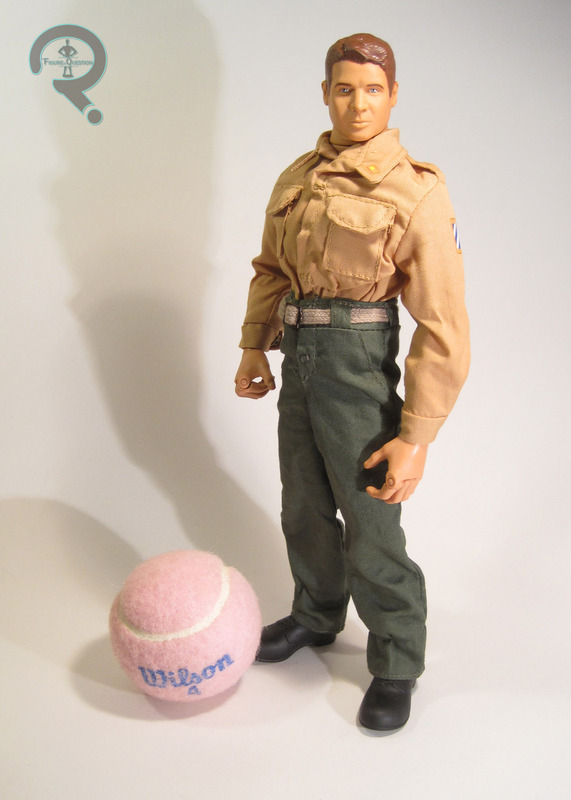 In addition to the generic soldiers that originally populated the line, Hasbro also peppered in some prominent historic members of the U.S. military. 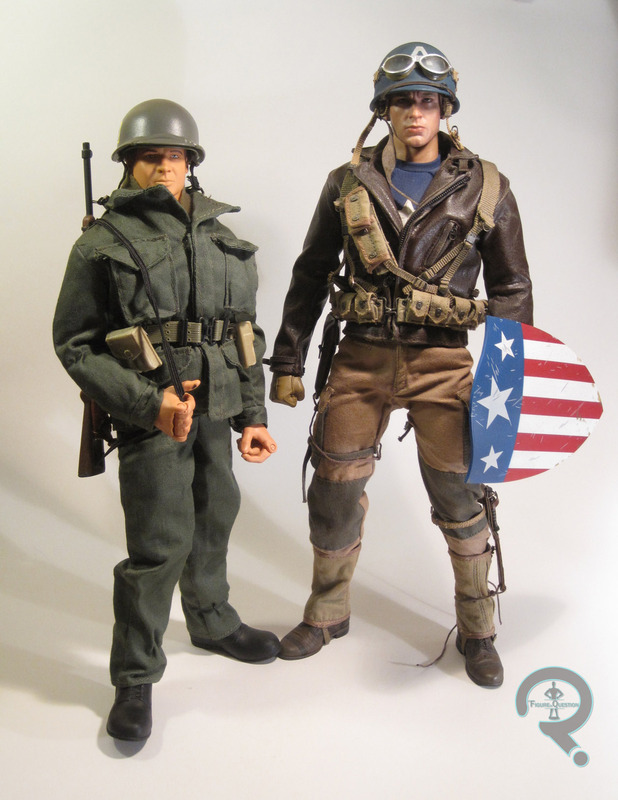 Today’s focus is one of those figures, Audie Murphy, who might be as close as WW2 got to having an actual Captain America. He was prominent not just as a soldier, but also as movie star in the ‘50s and ‘60s. And he got a G.I. Joe, so that’s pretty cool, right? 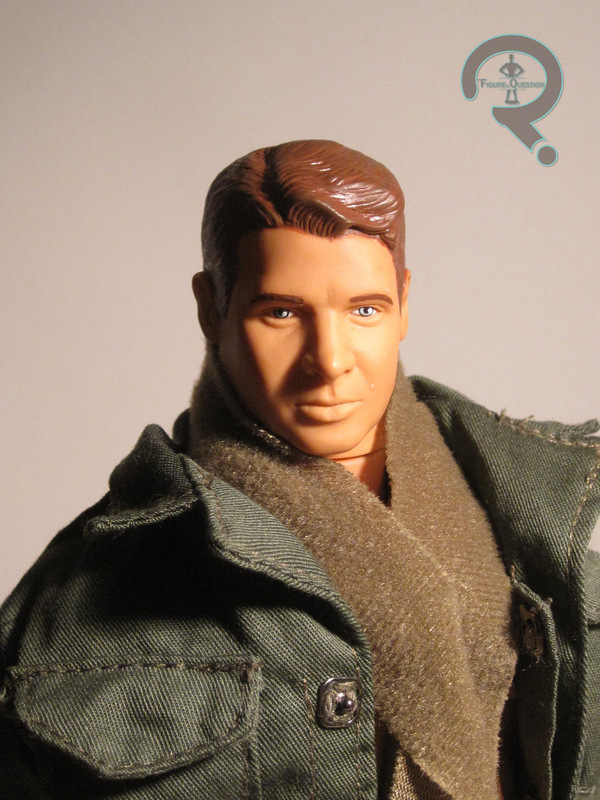 Audie Murphy was released in 2001’s Echo Series of Hasbro’s G.I. Joe: Classic Collection. He was an entry in the then-ongoing “Medal of Honor Recipient” sub-series of the line. The figure stands about 12 inches tall and has 42 points of articulation. 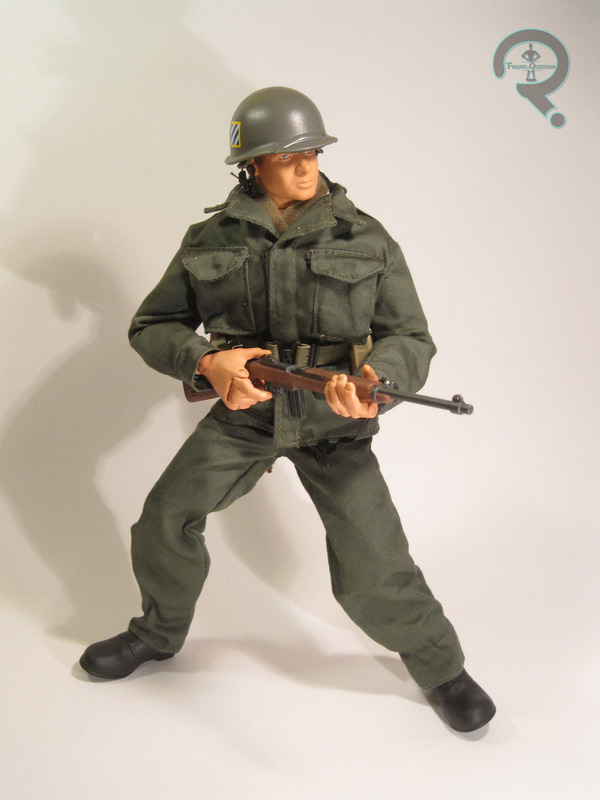 The figure is obviously meant to evoke Murphy during the events of January 26, 1945. It’s worth noting that he seems to actually be more pattered on Murphy’s appearance in the 1955 film To Hell and Back, which retells that battles events, and stars Murphy as himself. Obviously, there’s a lot more reference available from the movie, and it’s how most people are gonna think of Murphy, so it’s hardly the worst choice. The head sculpt is a respectable recreation of Murphy’s likeness. Obviously, it’s not Hot Toys quality or anything, but that’s hardly expected, given the time period and price point of this figure’s release. Nevertheless, it’s still a pretty solid sculpt, with some pretty impressive detailing. It’s perhaps a little on the small side in comparison to the body, but Hasbro was at the time still trying to shake off the really large, chunky heads of the early ‘90s, and I think this looks a little less silly than the alternative. The paint work is pretty clean, and there’s even a little bit of accent work on the hair. You’re not going to mistake him for a real person, but you can see who it’s supposed to be. Murphy is based on the at the time standard body for the line. It’s a body that definitely shows its age; the arms in particular are a touch on the long side, though this is really to aid with posing. As far as playability, it’s actually pretty great. It’s super posable, and can hold a lot of intense poses. He sports the “Gung Ho Grip,” meaning he had the individually articulated fingers, which are a lot of fun when it comes to posing. His uniform is made up of a field jacket, shirt, pants, two belts, a scarf, a helmet, and a pair of rubber boots. Like the head sculpt, they’re not comparable to anything from the higher end, but they fit well with the style of the line at the time. The tailoring is a little loose, mostly to help preserve his articulation. Due to the thickness of the fabric, when he’s wearing everything, he can look a little puffy, but that’s really the style of the time, and he won’t look super out of place. The helmet, second belt, and boots are all quite nicely sculpted; the helmet sits securely on his head, which is always a plus. 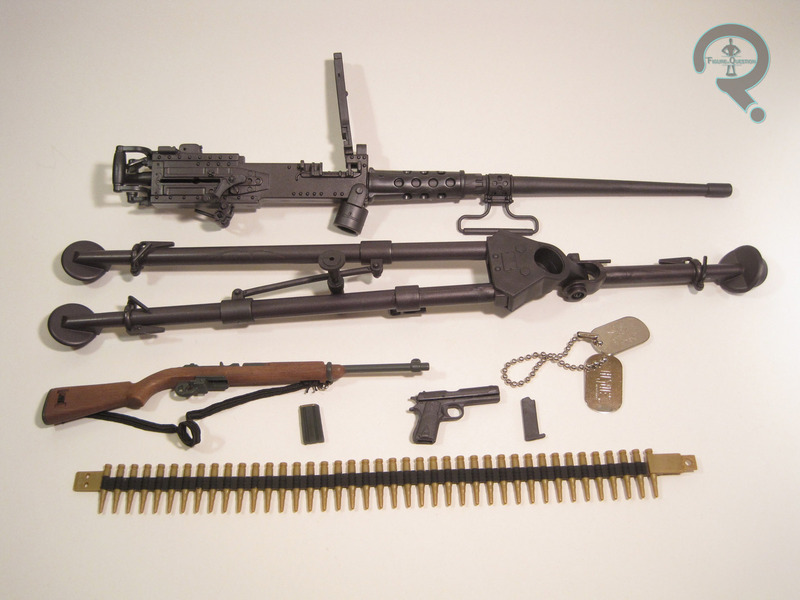 He’s armed with an M-1 Carbine, a .45, and a Browning machine gun. All three are quite nicely sculpted pieces. The Carbine’s my favorite of the three, and I think he looks the best holding it. Its got a removable magazine and a strap, which is cool. The .45 is also a pretty nice piece, though it looks a touch small in his hands. There’s a working slide and a removable clip, which are both pretty awesome touches. The Browning is supposed to replicate the one Murphy used during his standoff against the German forces. 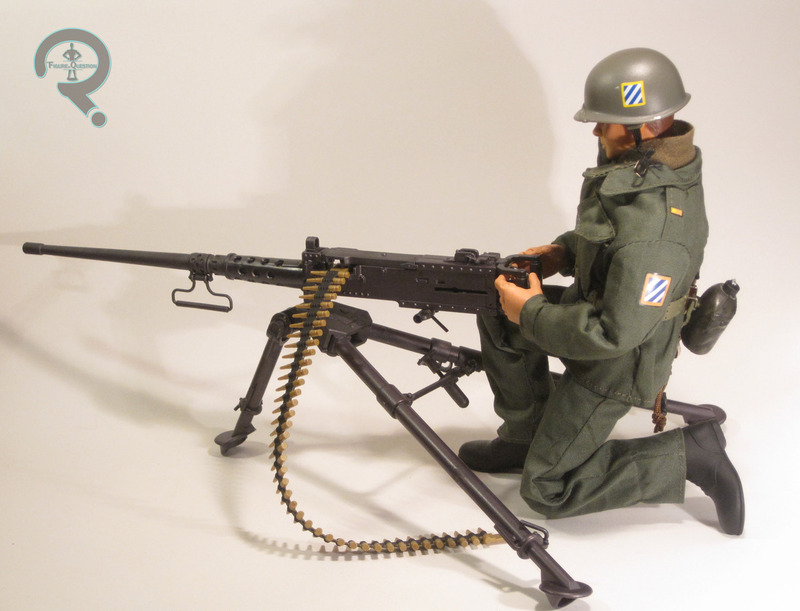 The main gun is pretty accurate, but the real thing was mounted to a tank, which obviously wasn’t feasible here. He’s been given a little tripod to stand it on, which is a little awkward to use. Nevertheless, it’s a cool piece. The ammo pouches, canteen, and holster are all designed to be attached to his second belt. It can be a little tricky to get them placed, but they stay on pretty tight once they’re on there. Lastly, there’s the dog tags, which predate G.I. Joe’s move to slightly more realistically scaled ones, and as such look super, super goofy on the figure. One thing that might have been nice to get is some sort of display stand, but they weren’t really common at this point. This Audie Murphy figure belonged to my Granddad. My family and I gave him to Granddad as a birthday present back in 2001, when the figure was still brand new. Remember how I mentioned that my Granddad moved at his own pace? Yeah, well he took this figure, unopened, and set it under a table in their dining room for several years. Then he finally removed it from under that table….to use it to prop up the TV antenna to get better reception. It would be hyperbolic to say this caused me actual, physical pain, but it did come quite close. In the last few weeks since Granddad’s passing, we’ve been doing a lot of work around the house, and I found this guy, still in his now horribly sun-stained packaging. With my Grandmother’s permission, I finally opened him, 16 years after he made his way into the house. It was a nice, somewhat cathartic moment. The figure shows his age, but I found myself genuinely enjoying taking him out and playing with him. He makes me nostalgic for my days of when I was super into this style of G.I. Joe, and I’m really just happy he’s finally been opened! I’ve touched very briefly on “Knightfall,” the huge cross-over series that introduced Bane, broke Batman’s back, and gave us the new Batman Jean Paul Valley (formerly Azrael). It’s actually one of the better regarded big cross-over stories of the ‘90s, largely due to DC consciously using common story elements for the time, and addressing some of the issues behind them. 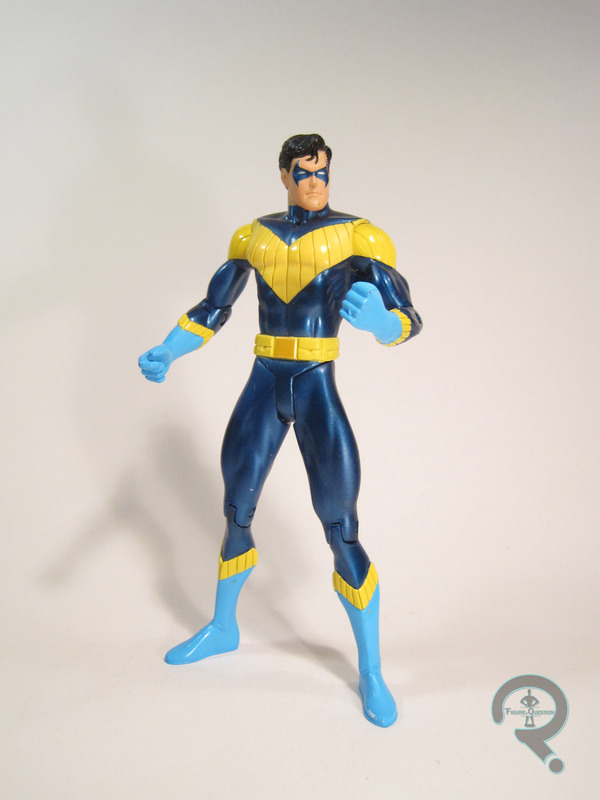 The story got some figures as part of the then running Legends of Batman line from Kenner, but no truly devoted line, until 2005, when the story was given a dedicated line of figures, courtesy of DC Direct. I’ll be looking at one of those figures, Nightwing, today. Nightwing was released as one of the five figures in DCD’s Batman: Knightfall series, which, as I noted above, hit comic stores in 2005. The figure stands 6 3/4 inches tall (he’s from the period where the DCD scale creep was really kicking into overdrive, so he was a good half an inch taller then the two prior Nightwings) and he has 11 points of articulation. He’s sporting his early ’90s costume, which generally isn’t one of my favorites. It’s largely to do with the particularly egregious mullet that always accompanied it, but also due to the way he tended to be depicted as super bulky in this outfit. I really have to commend this figure’s sculpt, because it makes a lot of those issues less present. In particular, his build is more svelte and similar to DCD’s prior Nightwings, and they’ve also gone with what’s probably the least dated interpretation of the mullet. The sculpt isn’t perfect, mind you. There are some slight oddities to the posing; his feet seem a bit wide spread, and I’m not entirely sure what’s going on with the left hand. Also, his thighs seem oddly…flat. Still, it’s remarkably well done, given how badly it could have turned out, depending on the iteration of the source material they followed. One of the coolest things about this guy is the paint work. The application is all pretty clean, and the colors just really pop. I particularly love the metallic blue color that makes up the majority of the bodysuit. It’s a good base color, and it really helps accentuate the brighter colors that have been placed on top of it. 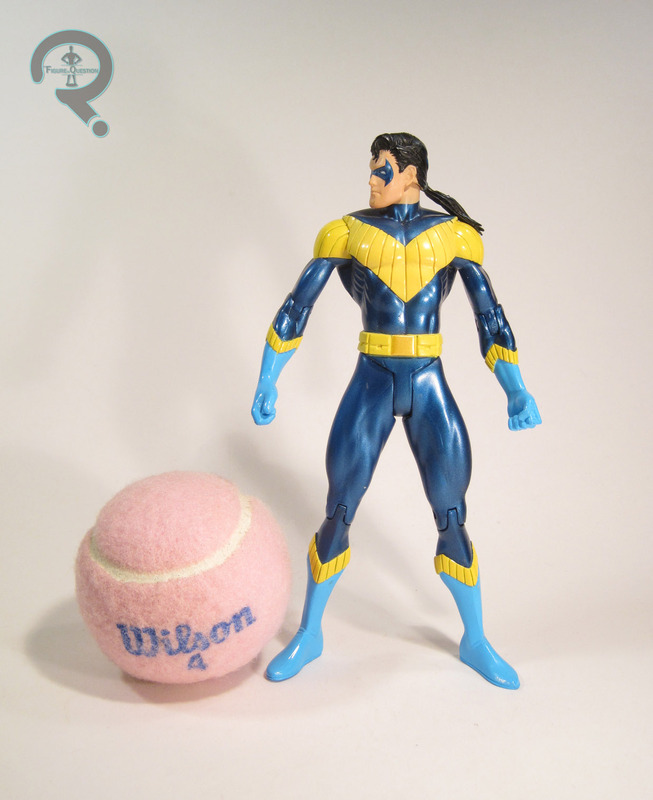 Nightwing included a little…disc thing? I guess it’s some sort of throwing weapon or something? Mine’s missing his, but he could hold it in his right hand. He also had a circular display stand with the “Knightfall” logo printed on it. I’m hard-pressed to come up with all that much interesting about this guy. I know I bought him from Cosmic Comix, because that’s where I was getting all of my DC Direct figures at the time, but the exact nature of when or why I got him doesn’t seem to be coming to me. I know I haven’t traditionally been a fan of this look, but this figure changed my mind on that. While he’s not my favorite DCD Nightwing, but he’s still a very solid entry. Also, one of only two figure versions of this particular design, for what it’s worth. It is a well known fact that the Guardians of the Galaxy movies are awesome. No one disputes this, it’s just true. As with just about every Marvel movie to come out in the last decade (yeah, Iron Man was in 2008, I had to look it up) there’s been a decent amount of merchandise out there. Regulars to the site will likely have seen at least one of Ethan’s numerous GotG figure reviews, but what if you’re one of those people who would rather be Star-Lord rather than just have him on your shelf? Thats where we get the subject of today’s review. The Star-Lord Quad Blaster was released in 2014 as a Marvel tie-in product to coincide with the release of the first GotG movie. Interestingly, there is no Nerf branding anywhere on the blaster, but just a quick mention on the box. 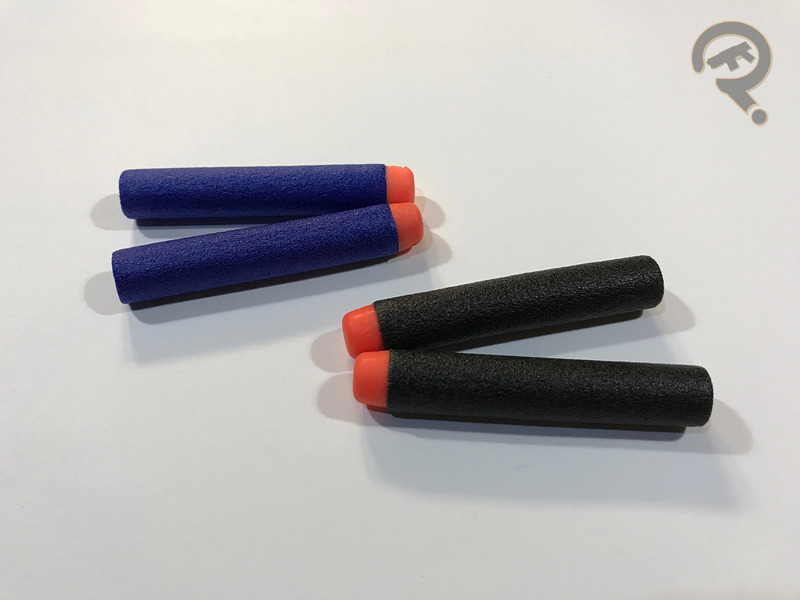 Aside from using a “smart air-restrictor” setup found in a plethora of other Nerf blasters, the Quad Blaster is completely original. The blaster is operated by priming one or both of the slides on the rear and pulling the trigger. 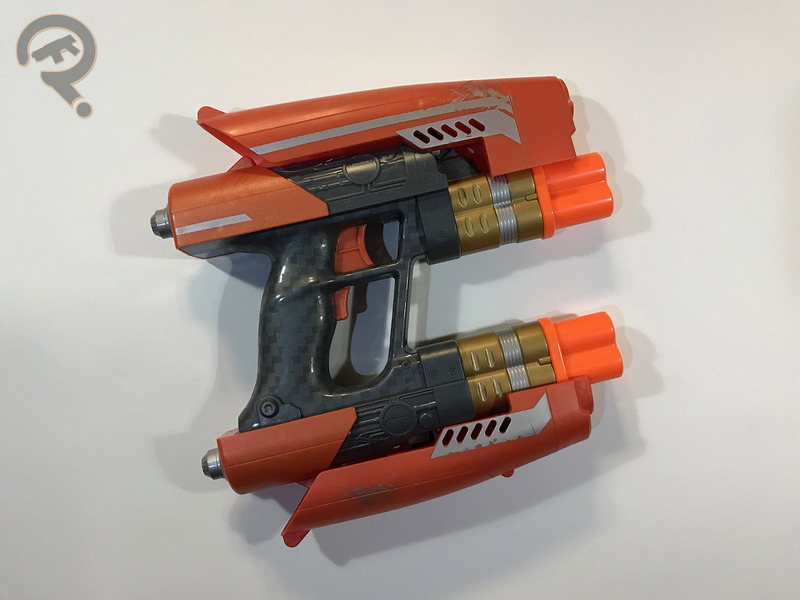 Unlike the Roughcut and other similar blasters, the Quad Blaster does not have a staggered trigger, if both barrels are primed, both will fire simultaneously. In addition, the smaller secondary trigger just below the firing trigger releases the latches holding the spring-loaded front ends, causing them to snap back, revealing two extra barrels. In all honesty, this feature was 85% of the reason I got this blaster. It’s just a ton of fun fiddling with even if you’re not actively firing the blaster, and if you flick your wrist just right, you can reset the barrel covers without touching them. Opening the front covers is required to fire the second barrels on the top and bottom. The blaster is very sleek and definitely has an appropriate sci-fi feel to it, almost like one of the plasma weapons from Halo. The grip could maybe stand to be a little bigger as I could see someone with larger hands feeling cramped while holding it, but it’s forgivable when you remember the target audience. 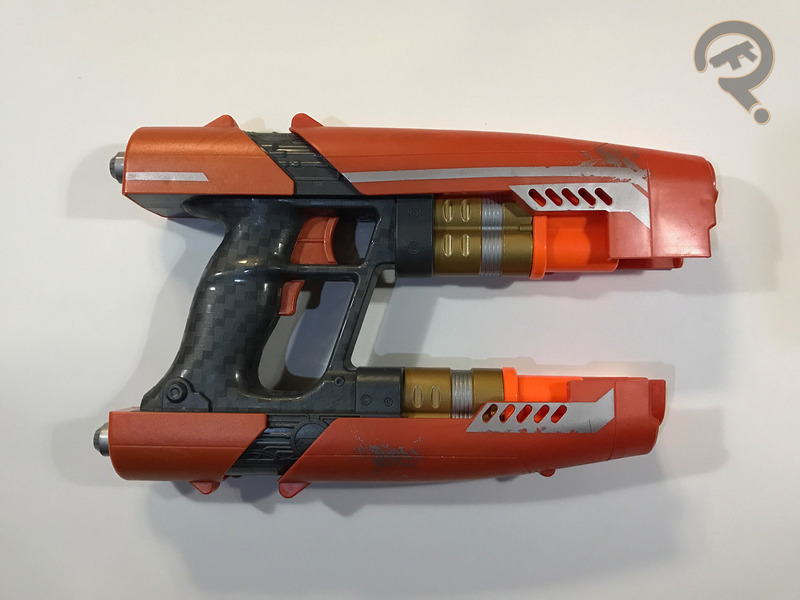 The main body of the blaster feels on par with other Nerf blasters in terms of structural integrity, but it is worth noting that the plastic for the priming slides feels a little thin, and the front covers are a smoother, slightly more rubbery plastic than the rest of the blaster. The priming stroke on the Quad Blaster is very short and not terribly heavy, as such, the performance is limited. It’s still fine for running around the house, blasting your friends, but even on longer indoor distances, the darts tend to drop off a little sooner than I might like and the impacts can feel kinda flaccid. 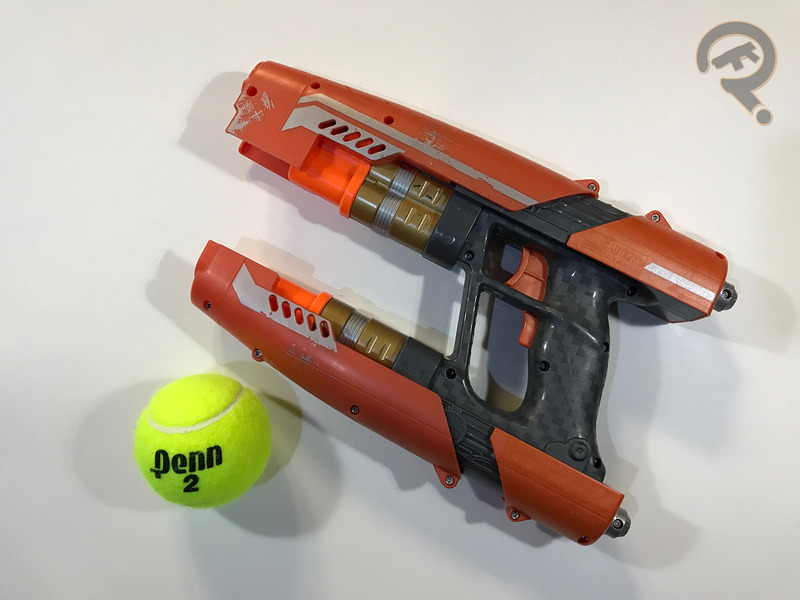 Again, I can understand this decision given this is meant for children, and Nerf has to keep it’s own core products competitive, but it’s still a bit of a bummer. The Star-Lord Quad Blaster comes with 4 Elite darts but with black bodies instead of the traditional blue. Unfortunately I wasn’t able to find all 4 of mine but I got 2 and some regular Elites for comparison. It’s become sort of a recurring event in my life where every time Chris Pratt is in a movie or tv show (Gotg, Jurassic World, Parks and Rec) people tell me that his character reminds them of myself. Normally I wouldn’t really take this to heart, but when my own mom is one of the most vocal people on this opinion, I figured I would just roll with it. I mean, it’s no surprise that I would buy a Nerf blaster, but being attributed with Star-Lord (WHO?!) just moved it up my priority list. The United States doesn’t hold a total monopoly on North American super hero teams. Case in point, today’s pair of figures comes from Canada’s premiere super-team, Alpha Flight, who are sort of a cross between the Avengers and the X-Men, but, you know, in Canada. They’ve never really taken off as a smash success or anything, but the team has something of a cult following. 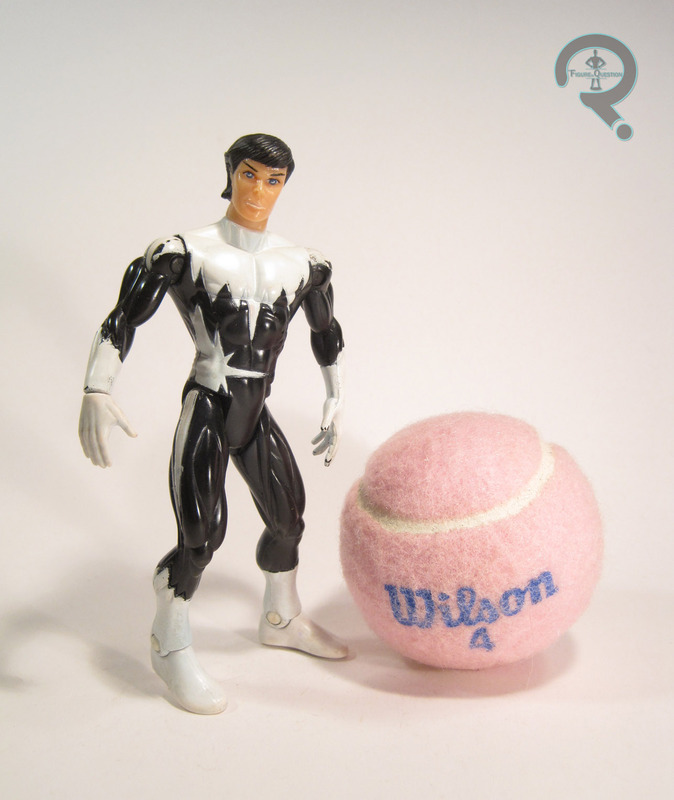 This was enough to get them a short series of figures during Toy Biz’s long-running 5-inch line. The whole series was made up of two-packs, and today’s figures are the ones that make the most sense paired up. Yes, it’s siblings Northstar and Aurora! 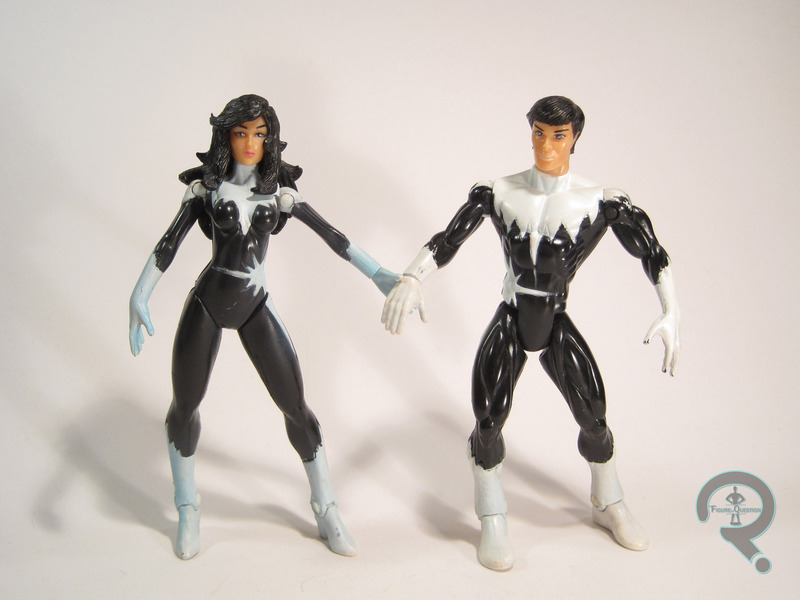 These two were one of the three two-packs released in the first (and only) series of Alpha Flight, released by Toy Biz in 1998. Northstar’s probably one of the best known members of Alpha Flight, thanks largely to his affiliation with the X-Men, and thanks also to being one of Marvel’s most prominent gay characters. He’s had a number of different looks over the years, but he’s seen here in his original costume, which I find to be his best. The figure stands a little over 5 inches tall and has 10 points of articulation. The movement on this guy is really odd; he lacks the elbow and knee joints that were fairly standard on 5-inch Marvel figures, but gains extra shoulder and ankle movement, as well as a cut joint on one wrist. Why just one wrist? I have no idea. It’s always bugged me. The sculpt for Northstar was all-new to him. 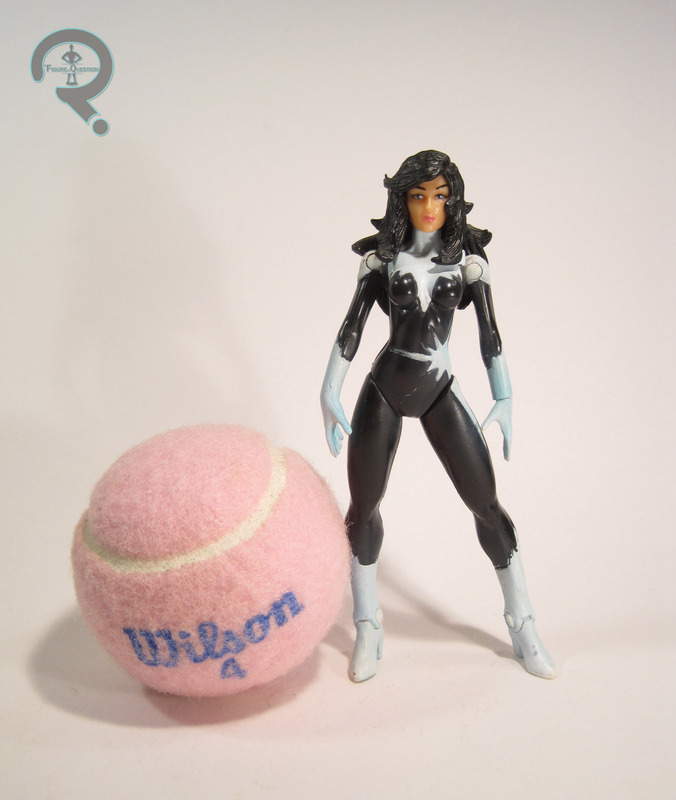 It’s okay, but not really one of Toy Biz’s stronger sculpts from this era. His proportions are kind of odd, and he’s got this strange sort of weird twist to his pose, like he’s trying to pop his back or something. I mean, there are some interesting elements to the sculpt, and it’s far from bad, but it’s just sort of meh. The paintwork on Northstar is passable; pretty straightforward color work for the most part. There’s some slight accenting work on the white sections, which actually looks pretty decent. As you can see, some of the paint hasn’t held up the best over time, but that’s not really on them. There’s a bit of slop around the edges, but nothing super awful. Though she’s a little lesser known than her brother, Aurora is still pretty well known, even if it’s largely in connection to her brother. She’s had less costumes than Northstar, but they’ve wisely gone with the one that matches her brother’s design, and once again I think it’s her best look, so I’m happy it showed up here. The figure’s about the same height as Northstar and has the same basic articulation, although she has those freaking v-hips that plagued my collecting habits in the ‘90s. The articulation’s still rather weird, but at least it’s consistent with Northstar. The wrist articulation is on the other side this time, allowing for them to touch hands. In general, I find Aurora’s sculpt to be of a higher quality than her brother’s. The proportions are still kind of off, but less so, and the pre-posing is downplayed. The head is definitely my favorite part, and it sports a ton of really awesome detail work, especially on the hair. Her paintwork is fairly similar to Northstar’s, but once again, it’s a slight step up. Things are a bit cleaner, and the accenting on the white parts are a little more noticeable, which I thing looks a bit better. I picked this set up new, I’m fairly certain from a Target. I didn’t actually know the characters at the time, and mostly wanted them because they sort of resembled the Wonder Twins. My dad, who bought them for me, also got me the first Essential collection of X-Men around the same time, and had me read Alpha Flight’s first appearance, which was contained there-in, so I knew who they were. I remember getting them pretty fondly. They aren’t Toy Biz’s best or anything, but they were probably the best from this particular series of figures, and I’m still pretty happy with them. Side bar: I reviewed these figures while at my friend Scott Farquar’s house. He also owns this set of figures, which were actually given to him by me, almost 20 years ago. He wanted me to mention that here. He’s sort of goofy like that. The ‘90s X-Men line initially started as a pretty straight cartoon/comics-influenced, but as it progressed, Toy Biz started running out go authentic variants of the main characters, and had to start creating their own. There were a number of gimmicky-themed series. Today’s focus hails from one of those series. So, let’s have a look at the X-Men’s resident lovable rogue (who also loves Rogue…wait, I’ve done that joke before…), Gambit! 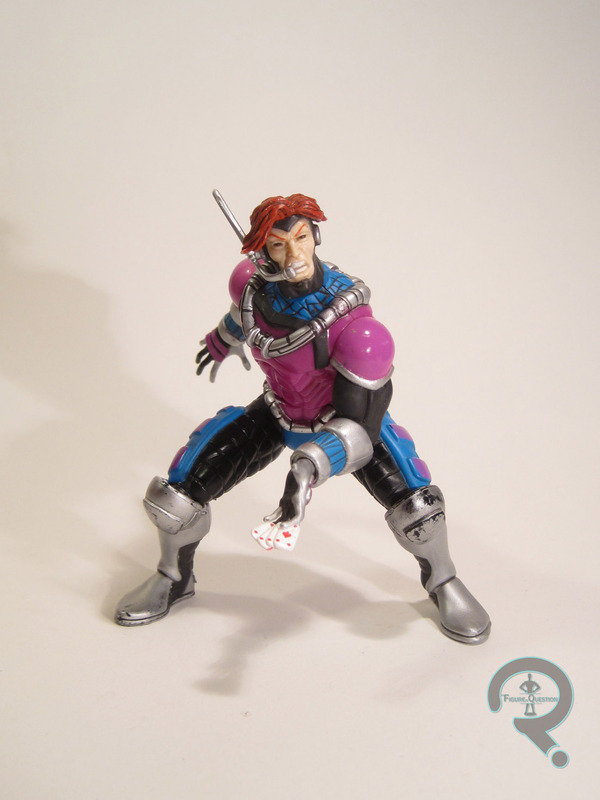 Gambit was one of the five figures that made up the “Robot Fighters” series of Toy Biz’s X-Men line. 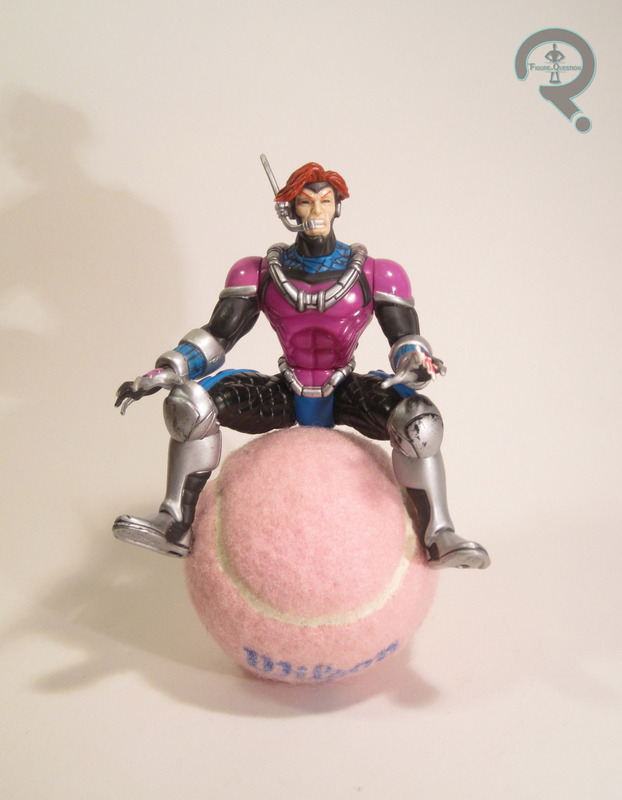 It was Gambit’s third 5-inch figure, following the Light-Up Series release. The figure stands about 4 inches tall (thanks to the hunch) and has 8 points of articulation. At this point in the line, they were cutting back on the articulation on most of the figures (likely in an attempt to capture some of the McFarlane Toys style), so Gambit wasn’t unique in this. The Robot Fighters designs were (largely) unique to the figures; Gambit takes a lot of influence from his main design, sans the coat, albeit with a few more armored bits and such. I’m not really sure how the Danger Room set-up given in the bio text translates to this new design, but I find the design to be pretty cool, so I’m hardly complaining. As far as the sculpt goes, the best part is definitely the head, which I think may be my favorite Gambit sculpt out there (Toy Biz seemed to like it too; it was re-used later down the line on a Strike Team Gambit). It’s just really sharply detailed, and they expression looks really dynamic, and almost Kirby-esque. I’m not sure what the headset is for, but it looks kinda neat. This whole series was really hit pretty hard by pre-posing, and Gambit sticks with that. He’s in this really deep crouching pose, and the articulation doesn’t let him get out of it. It’s not the worst pose ever (there were some far worse ones in this very series), and you can actually change it up a bit and get some really cool mid-action poses, which works well for the proposed setting. The detail work on the body is a little varied, which some areas being a little more detailed than others, but it’s pretty solid overall. I particularly like the molded playing cards; the removable ones always seem to get lost! The figure’s paint is pretty straightforward; the palette is definitely Gambit-like, and the application is all nice and clean. Nothing’s been left unpainted, and there’s even some nice accent work on the hair and a few of the torso’s elements. Gambit was originally packed with the Robot Fighter mentioned in his bio, officially dubbed the “Attack Robot Drone.” It shots missiles, because it was the late ‘90s and everything had to shoot missiles. I don’t have that piece, having acquired my Gambit figure second hand. I remember the Robot Fighters Series hitting retail, and I remember seeing them all over the place, but somehow I never ended up with a single one of them. Gambit amends that. I fished him out of the loose figures bin at All Time Toys. This is the first figure I’ve bought from them since they re-opened after Ellicott City’s Main Street flood, so he’s kind of special to me. The actual figure is honestly not half bad. I mean, he’s uber-‘90s, but it’s at an enjoyable level. I’m happy that I finally tracked this guy down. I guess I should get the rest of them at some point. Remember two weeks ago when I reviewed thee Big Hero 6 Yokai figure? And how I mentioned picking up a bunch of them? Well, I gotta review them sometime, right? So, today, I’ll be looking at one of the film’s central characters, Baymax. Here goes! 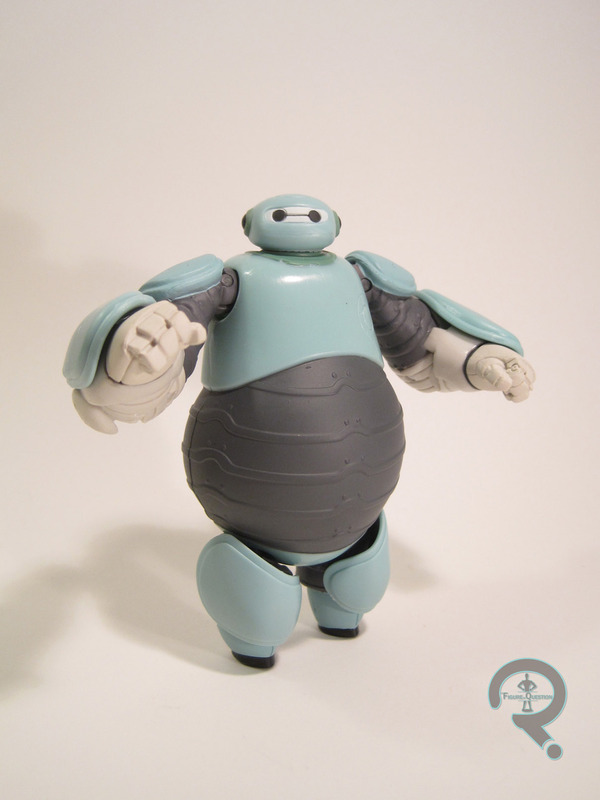 Prototype Armor Baymax was released in the second series of Bandai’s Big Hero 6 line, which hit a little bit after the movie’s theatrical release. He’s one of four versions of Baymax to be released in the line and depicts him in the initial armor Hiro designs for him (which I personally prefer the design of to his later, more advanced armor). The figure stands about 3 3/4 inches tall and he has 11 points of articulation. As with Yokai, there are the ever present issues of scale. At least the two of them look fairly decent together, though. Additionally, the sculpt on Baymax seems to be a bit more internally balanced, at least as far as the proportions go, which makes for an overall better looking figure. He adheres pretty well to the onscreen design for the most part. All of the important details are there, and they’re mostly where they should be. The legs are definitely odd in the way they connect to the body, and are oddly shaped in general, to say nothing if the obstructive, obvious, and mostly useless hip articulation that the legs are attached with. I’m not entirely sure what they were going for there. At least the rest of the sculpt is pretty solid, with only minor issues (such as the slightly bulkier shoulders). I do wish he could get his arms a little closer to his sides, but that’s minor. 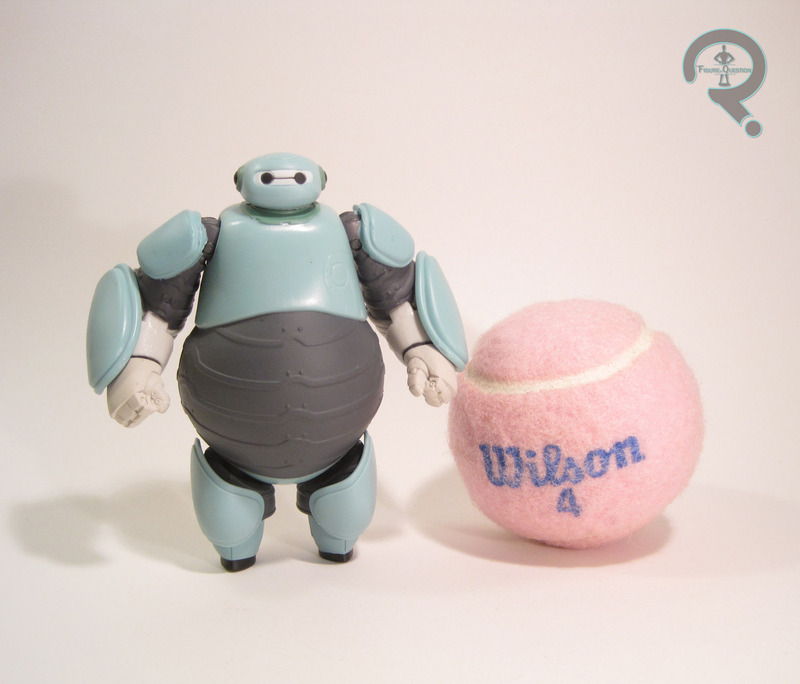 Baymax’s paint work is about on par with the rest of the figures I’ve looked at from this series. The colors all match up well enough with those from the movie, and the application is largely sharp and clean. There are a few unpainted details, but that’s the sort of thing you expect with Bandai America, so it is what it is. Baymax includes no extras, which I guess is okay. What exactly would you give him? I almost grabbed this figure numerous times at retail, as it was by far my favorite of the three Baymax designs, and I really did want a Baymax. But, for whatever reason, I just never got around to picking him up. I was actually pretty excited to find him marked way down at Ollie’s, so he was the first figure I grabbed. The final figure is okay. Not quite as fun as Wasabi, but a bit of a step up from the slightly disappointing Yokai, which is decent enough. 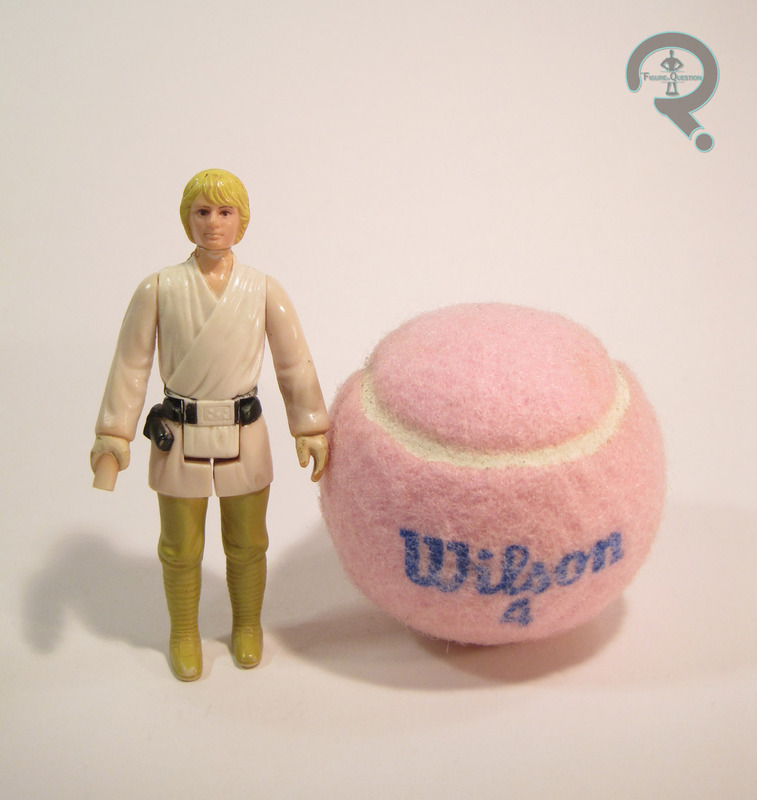 Luke Skywalker has over 100 action figures, which is quite a few. More than just about any other main character from the franchise, in fact. There was a time, however, when he had just one. His very first figure was released by Kenner in 1978, and that’s the one I’m looking at today. There’s your intro. 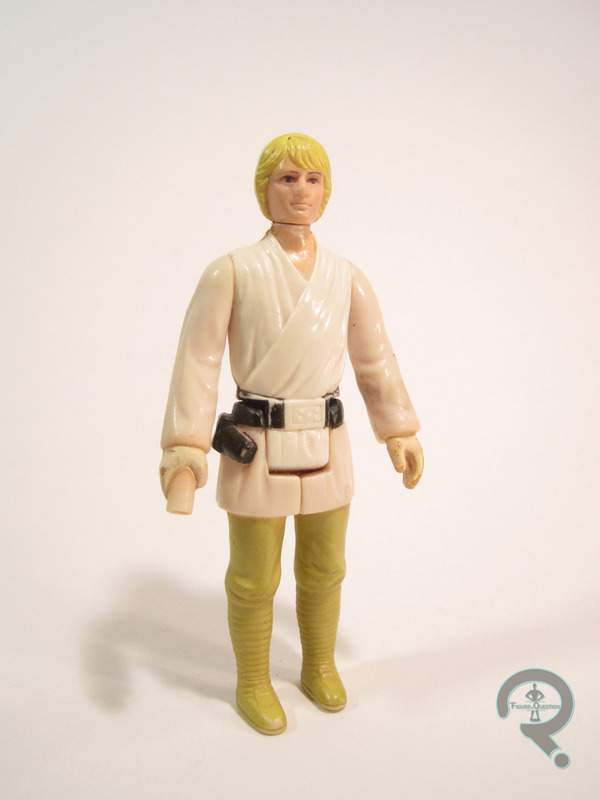 Luke is one of the very earliest entries in Kenner’s Star Wars line. 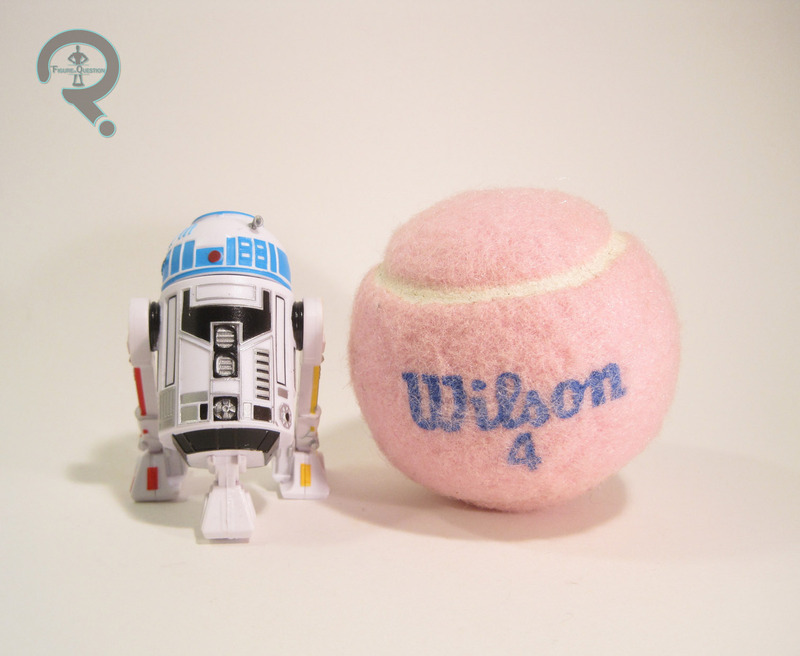 He was initially released in the Early Bird set, alongside Leia, Chewbacca, and R2, and later saw regular release as one of the line’s first 12 figures. He was also consistently carried throughout the run of the original trilogy’s line. My figure comes from the earliest of the single releases, or at least that’s what I’ve been told. The figure stands about 3 3/4 inches tall and has the standard 5 points of articulation (or at least he did; my figure had his head snap off, necessitating it being glued back in place). The figure sported a unique sculpt at the time (though the head would later see reuse on the Bespin figure from the Empire line), which is decent enough, at least in the context of the rest of the line. He’s not super detailed, nor is he the spitting image of Mark Hamill as Luke, but the main elements of the character have been conveyed pretty well, and he’s certainly not awful. His design has also been graced with very few real compromises, which wasn’t completely unheard of in this line, but it was pretty rare. As one of the three lightsaber wielding characters in the first film, he got one of the retractible blades that Kenner was experimenting with early in the line. The hilt of the saber is molded in Luke’s hand, and the majority of his right arm has been hollowed out. There was then a separate blade, which could be pushed up or down, as if he were igniting the saber. It’s not a particularly accurate rendition of the saber, and it requires Luke to hold his weapon in a way he never does in the film. Luke’s saber was molded in yellow, because, umm, reasons, I guess? Of course, you can’t see that from my figure, because they were also really easy to lose, which isn’t ideal. Still, it wasn’t the worst concept ever. In terms of paint, Luke is fairly simple; he’s got al the basic colors, and that’s about it. There were a number of variants on the hair color; mine has the more common bright yellow. Not super lifelike, but it’s about right for the time. Luke included no accessories. When I was growing up, I had access to a lot of my dad’s old toys. His collection of Star Wars figures was one of the sets that was given to me to keep. Luke was by far my favorite of the set, and saw a lot of play time. His head broke off at some point, and there was a good five years in there where I never seemed to be able to hang on to both pieces at the same time. I eventually did find both pieces and get him put back together, so that was a small victory. The figure’s not perfect, but he’s a pretty good starting point, and he’d remain one of the better Luke figures out there for quite a while. It’s kind of odd that his bio mentions the Doom Patrol, but not the Teen Titans. I’m not complaining, just noting that that’s the way they went. 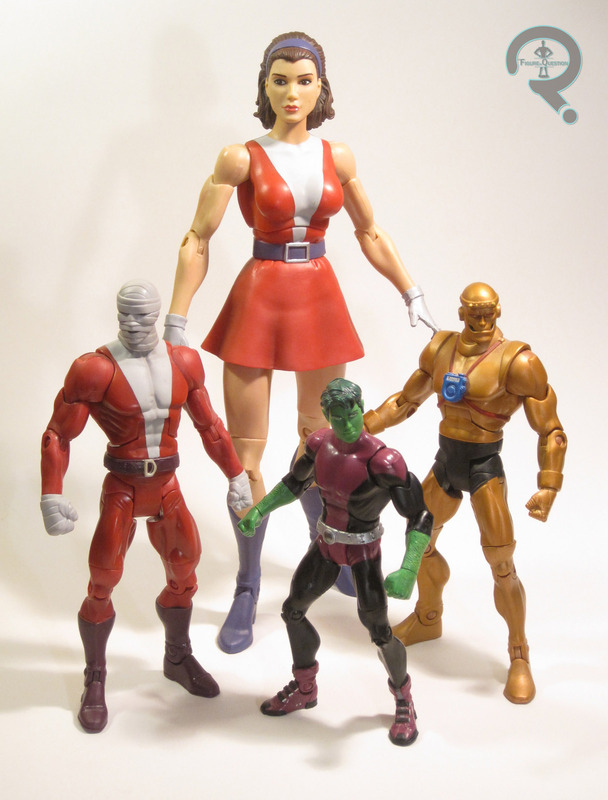 In regards to DC Universe Classics, I’ve looked at Negative Man, Elasti-Girl, and Robotman. The only Doom Patrol member they released that I haven’t yet looked at is the aforementioned Beast Boy, adopted son of Elasti-Girl (but we don’t seem to talk about that anymore), and, more prominently, member of the New Teen Titans. 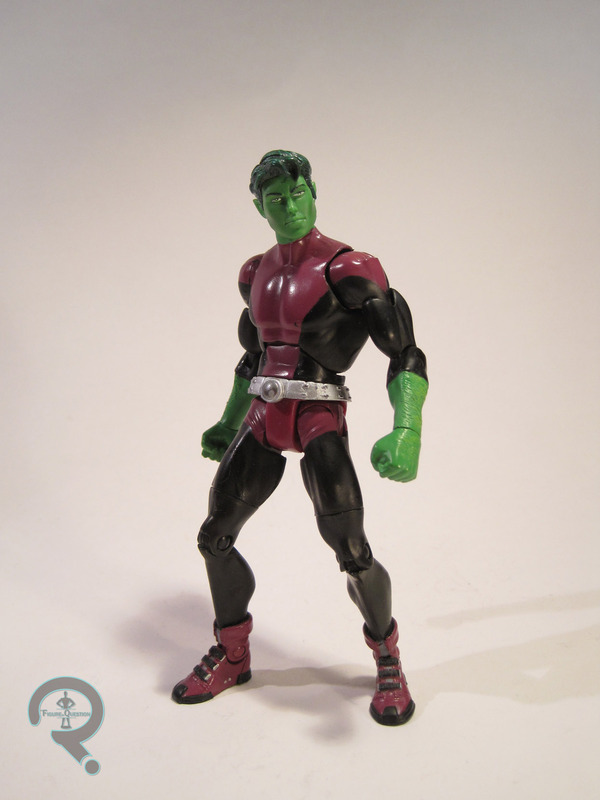 Beast Boy hit in the Walmart-exclusive Series 10 of DC Universe Classics, alongside fellow Doom Patroller Robotman. The figure stands about 5 1/2 inches tall and has 25 points of articulation. The sizing on this guy is confusing to say the least. He’s effectively wearing his costume from the Teen Titans cartoon, which was worked into the comics when Gar rejoined the Doom Patrol after “One Year Later.” When Gar was wearing this costume in the comics, he was a full-grown adult, but this figure builds him on the small teen male body (introduced on the Series 3 Robin figure), as if he were just the version of BB from the cartoon. This wouldn’t be a huge issue if the BB-specific parts weren’t clearly meant to be emulating the older Gar from the “One Year Later” storyline, and built with the proportions of an adult. So, the end result is a Beast Boy that just sort of seems out of scale with just about everything. I’m fine with Gar being a little smaller than the rest of the Patrol, but a full inch difference seems a little excessive, and he’s actually just flat-out in the wrong scale. What’s really frustrating is that the actual sculpt really isn’t that bad. He’s a pretty solid recreation of Gar from this period in the comics, and has a lot of nice little small details, such as the arm hair on his forearms, and even the really sharp work on his shoes. The hair is a separate piece, which makes its contrast really sharp, and the ears even have the point they gained in later designs. It’s clear a lot of effort went into this sculpt; he’s simply too small. The figure’s paint is pretty solid, at least; the colors are a good match for both the comic and the cartoon, and everything is applied pretty cleanly. There’s not a lot to mess up here, and Mattel succeeded in not messing it up. Good for them. 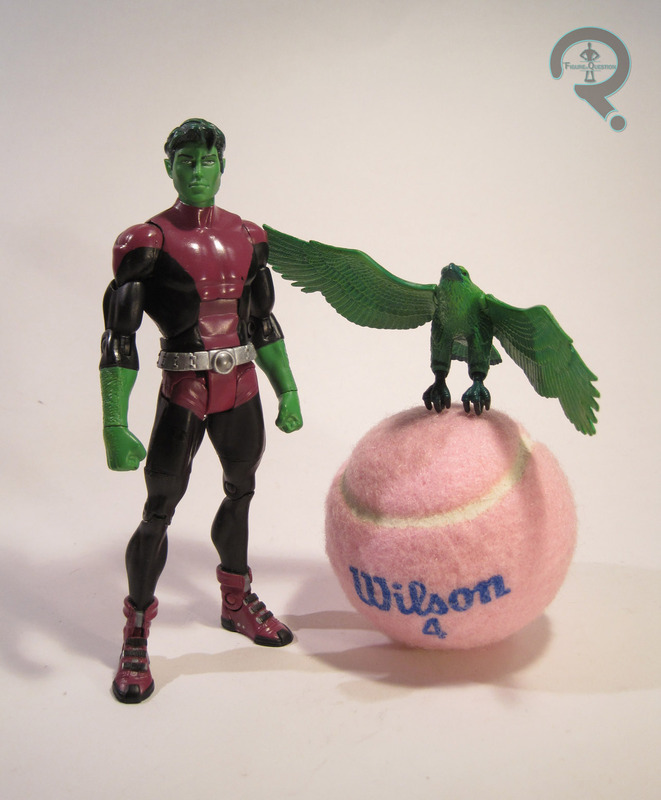 Beast Boy included a green falcon (re-used from the MotUC line), meant to emulate his shape-shifting abilities, as well as the right arm of the series’ Collect-N-Connect, Imperiex. Woo. Beast Boy is one of the earlier figures I got from this series. Just after it started hitting Walmart, my dad and I had a few trips just checking our local stores, and he was one of the ones we found. I’ve always liked Beast Boy, and at the time I was super pumped about getting the Doom Patrol as action figures. I can acknowledge some of this figure’s merit, and I certainly don’t hate him, but he disappoints me greatly. He’s kind of a perfect example of DCUC in a nutshell; great in theory, and in 95% of the execution, but there was just enough leeway for Mattel to find a way to screw him up. They were so close, and yet still so far.